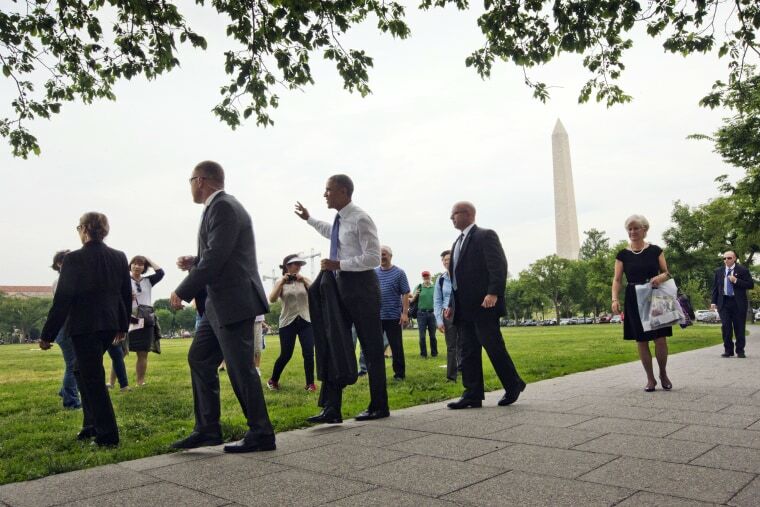 It was a rare view of President Barack Obama: strolling along the National Mall with suit jacket slung over his shoulder. "The bear is loose," the president said to a press pool accompanying him on a muggy, spring afternoon as he walked through a grassy area on the mall known as the Ellipse. "It's good to be out." Obama was on his way Wednesday to the Interior Department to sign a proclamation designating a national monument in New Mexico. After making some remarks, he retraced his path back to the White House and greeted tourists, including some from China and Germany. "We can shake hands. I won't bite," Obama said as he ushered them over, despite being flanked by burly Secret Service agents. One lady squealed after shaking hands and taking pictures with the president. He wished another onlooker happy birthday. Obama's busy day included meeting with Veterans Affairs Secretary Eric Shinseki in the morning amid an investigation of veterans hospitals across the country, and honoring the Super Bowl champion Seattle Seahawks at a White House ceremony in the afternoon. In the past, Obama has walked through Lafayette Square adjacent to the White House to attend church services with his family. During the partial government shutdown in October, he walked to a sandwich shop on Pennsylvania Avenue that was offering discounts to furloughed federal employees. But typically the president rides in a heavily guarded motorcade to wherever he's going.